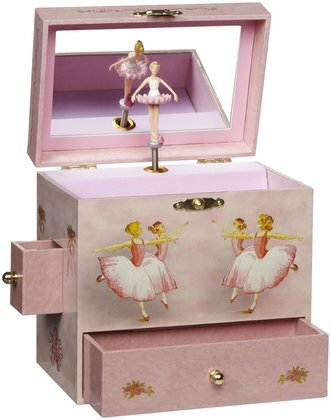 Ballerina Jewelry Box - Every Little Girl Should Have One! This ballerina-themed Jewlery box has ballerinas gracefully taking flight with twirling tutus and dancing shoes. The front, back and two side drawers hold jewelry and other treasures. The music box plays "Swan Lake" with a dancing ballerina figurine.